About 1934 the Peck’s began to take holidays at the Hut at Mount Eliza, which belonged to Arthur Peck, Nigel’s grandfather. Hugh asked Arthur if he could take family holidays there and build a kitchen onto the main Hut so that it would be suitable for families and not just a fishing hut virtually for males. Hugh built the kitchen because it was in the depression and he had very little work on and could undertake such tasks. The kitchen was built of cheap materials and Nigel decided to pull it down and rebuild it in the same format but with jarrah timber as used in the original Hut. It was all undertaken in 2003 with a view to making the whole structure of the Hut last another hundred years as the original room was built in 1901. Many family holidays were held there from 1936 Christmas onwards. The family spent at least 4 or 5 weeks at the Hut and of course all the goods had to be carried down the cliff through the Grimwade property. Tents were erected, and there was always one for Tony and Nigel and a smaller one for the maid. Arthur Peck had left a dinghy at Davey’s Bay and this was put to everyday use. Rowing was good exercise and both Nigel and Tony became very strong rowers. Nigel won three silver cups for winning rowing races on regatta days. Nigel was not allowed to sail in yachts until he could swim 100 yards. He was somewhat timid about swimming and didn’t want to have swimming lessons. He developed quite a passion for sailing and used to watch the races with considerable excitement at Davey’s Bay with General Grimwade’s Chiquita, the Grice’s Naree, Walter’s Marguerite and the Laver’s 14 ft open dingy Seagull which also often capsized. It had an extraordinary large sail area and a very tall mast. Then in about 1936/7, Snipe class yachts were introduced at the Club and soon there were 7 or 8 of these sailing. Llewelyn Lewis’s Seafarer (No 9), Hardy Smith’s Seahawk (No 7) and Ian Mackeddie’s Scud (No 8). When Ian went to Sydney to live, Hugh Peck purchased Scud in partnership with Steve Vance. Nigel ultimately sailed the boat when allowed but not in races. There was also Seamaid which Douglas Galbraith and John Grimwade sailed. They originally had a boat called the Maid before that. Also, there was a stalwart of the club, Ivan Walter, who then owned Marguerite bought from Guy Madden in 1928. No 1 in the club and was in the first DBYC Cup sailed in Jan 1911. This boat has been purchased by Nigel Peck and restored by Blunts Williamstown Boat Builder in 2011 and gifted to the club. This 16.6’ sailing dinghy was built in 1888. One day there was a Club cruise and Nigel was not allowed to sail because he hadn’t reached the swimming qualifications specified by Hugh and Gwen. He ran along the cliff towards Mornington, following the yachts that were beating into a southwesterly and much to his delight, they ultimately pulled up to the beach, somewhere around Sunnyside (presumably). The cruise stopped for only a short period to have a cigarette and a chat. They then headed for home. Nigel was offered a place on Marguerite, which was the sailing dinghy, which was the only centerboard exhibited in the Melbourne Maritime Museum, home of the Polly Woodside. Guy Madden, the son of Sir John Madden who was the first Commodore of the Club, had first owned Marguerite. At this time it was owned by Ivan Walter which was about 1929. It so happened that Nigel’s mother, who was sitting on the cliff at the point near the Hut (which she didn’t often do) happened to see a small boy sitting in Marguerite sailing into Davey’s Bay and being hit by a heavy gust of wind, leaning at a 45 degree angle. Nigel was “sprung” and was grounded for a couple of days. He learnt to swim soon after that episode. Until then he was not allowed to go out in the yachts. In 2006 the Polly Woodside Museum was demolished and most of the artefacts were returned to people that gifted them or were sold. Marguerite was sold to the Blunt family. 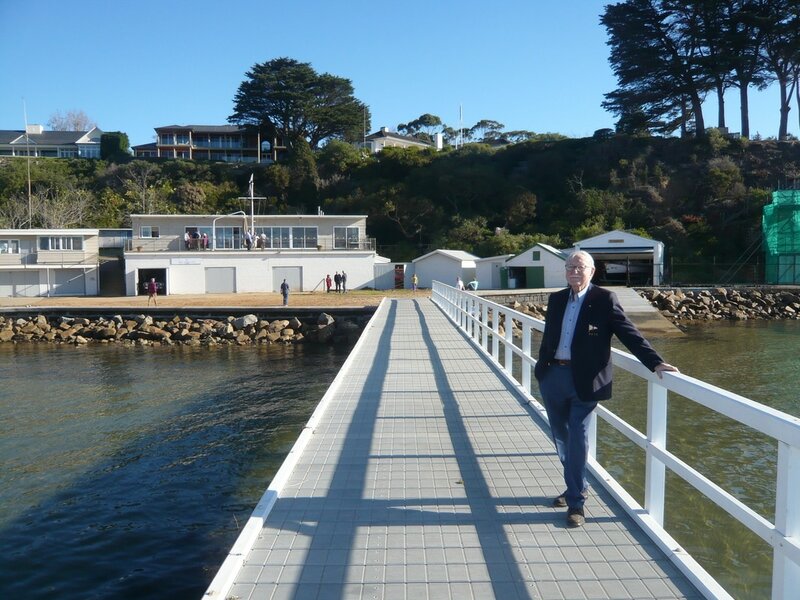 Nigel contacted the 6 generation boat building business, still at their original space between The Hobsons Bay Yacht Club and Royal Yacht Club of Victoria. Nigel contacted Greg Blunt and bought the greatly deteriorated yacht which Blunt agreed to furbish for $12,000. Nigel donated this to Davey’s Bay Yacht Club. In 1937-38 Hugh Peck rented a caravan and took the family caravaning to Gippsland for approximately 10 days. This included a stop at Metung to stay on the property of Doctor Atkinson Wood ‘Willie Wood’, the person who built Woodcote next to the Hut ie what is number 4 Brookwood Drive, and the Peck Beach House. Willie Wood was a Doctor who never practiced and was the person who introduced Arthur Peck to the area and proposed to him that he build a fishing hut. Arthur used to sail Maysie to Davey’s Bay and he and Willie Wood would go fishing together. The water Gymkhanas or Regattas as they were called were a big event on the Australia Day weekend, which was then called ANA Day (Australian Natives Association). Nigel was never successful in any of the swimming events but won a prize in the greasy pole event and of course a few dinghy races. Nigel, being a shy boy, did not mix a lot and spent much time playing with his toys which included model yachts and racing jam tins from the Grimwade jetty in front of the Hut. Gwen often invited Nigel’s friends to come to the Hut to stay.